Now a National Historic Landmark, this blast furnace produced iron for nearly 90 years and helped build ‘the Magic City’ of Birmingham. Tours: Free Self Guided Tours and Cell Phone Tours on Tues-Sat 10am-4pm, Sun. 12pm-4pm, closed Mondays. Book ahead for scheduled or group guided tours. 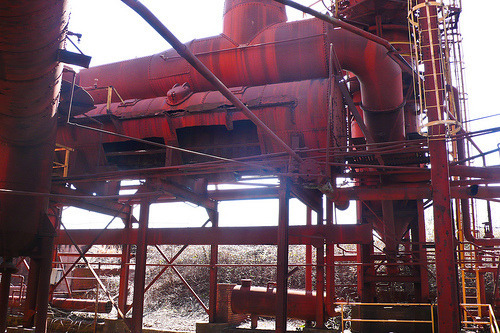 My Flickr set: Sloss Furnaces (34 pics) …or see the slideshow at the end of this post. I had two hours left of my 24 hours in Birmingham. Fortunately, the Tutweiler Hotel’s hotel valet offered to run me over to Sloss in their airport pickup van for a quick look-see – much appreciated as the entrance was pretty damned hard to find even by car and no easy walk from Downtown. I happened to be there on a Monday, so Sloss was closed. But a serendipitous open gate on the perimeter meant that I could document some of its web of rusting pipes and smokestacks. It really is an incredible set of preserved industrial buildings in all shades of orange, red and brown rust and in many atmospheric shapes. It ran from 1881-1970 and in its early heyday of long hours and poor working conditions, many workers lost their lives either to the furnace or its machinery, with several particularly grisly deaths creating its reputation for being one of America’s most haunted locations. I have to admit that peeping through a broken window sent chills down my spine – even though it was a hot summer day – and I scooted. These days, Sloss hosts a renowned educational metal arts programme and also acts as a concert/event venue - particularly, of course, at Hallowe’en, hence the grisly disembodied hand in my Flickr pics. What it is: The world’s most famous chocolate factory, with its global roots in the leafy suburb of Bournville, Birmingham, and a renowned social conscience for providing its workers with housing, education, healthcare and other social benefits. 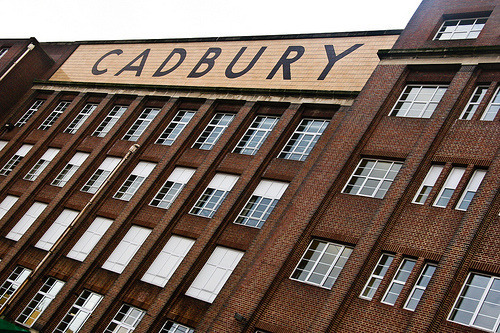 While you can’t tour the factory itself, visitors can see how the chocolate is made and hear the Cadbury story at Cadbury World. Tours: Open daily. £13.90 for an adult, £10.10 for a child, family ticket £42. My Flickr set: Cadbury’s Chocolate Factory (37 pics) …or see the slideshow at the end of this post. After Cadbury’s was taken over by Kraft Foods in February 2010, I felt the need to walk through the Birdcage, the fenced walkway that runs through the factory grounds and on to Cadbury World. It was a slightly emotional walk. My mother worked at Cadbury’s for many years in the 1970s and 1980s, and in many ways the close-knit community of women workers and the tough working conditions were the making of her as she fought for worker’s rights as a shop steward and began a fundraising career that ended up with the likes of Adrian and Dominic Cadbury, grandsons of George Cadbury, in her fundraising pockets. Back then there were thousands of workers, mostly women, working ‘on the belt’, placing chocolates manually into assortment boxes for hours on end. Now, the factory itself seems as much of a ghost town as Sloss thanks to increasing levels of mechanisation. Cadbury World, meanwhile, is thriving as a tourist sideshow showing how the chocolate is made, the history of Cadbury’s through the ages, and, of course, giving visitors the all-important chance to test the wares and buy in bulk at the Factory Shop. But somehow it seems a bit soul-less and packaged from its origins as a Quaker family business. I was disappointed to see that the factory tennis courts needed weeding, the fishpond has turned to gloop and there seem to be more tankers and lorries than people arriving at the factory gates. All a sign of the corporate times, I suppose. And yet somehow the original spirit of Cadbury’s still runs through the blood of Bournville. The local village green hosts a number of community events, while last weekend the Bournville Festival on the Cadbury cricket ground still had its maypole and funfair. Best of all, you can still smell the chocolate wafting on the breeze on a good day. Sadly, there are no guarantees that Kraft will keep the site open or that chocolate will continue to be made here in the years to come. The commercial nature of the plant means that it is unlikely to become a National Historic Landmark like Sloss any time soon. In this respect, although Sloss no longer functions industrially, Birmingham AL is lucky.